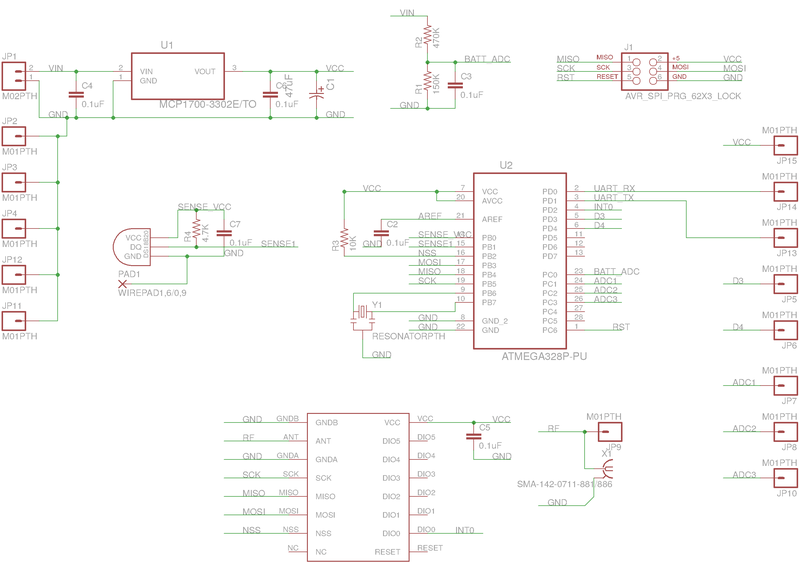 This board was designed as a cheap and easily assembled Sensor Node for newcomers. Due to the large amount of broken-out GPIO, it could also be used as a development board for a repeater, gateway, or other device. In this setup the node could be configured to transmit Temperature, Humidity and Battery Voltage every couple of minutes. Due to the powersaving used on the Microcontroller and Radio, as well as the switching of the DHT22 Supply, the expected battery life would be around 9 months. In this setup the node is configured to listen, repeating other nodes that are heard and helping extend the network. This is the cheapest and will work well for sensors where the average current draw is tiny, and so no recharging will be required. This is the cheapest rechargeable solution. Research into easy methods of trickle charging Ni-MH is currently underway. If you're confined on space, LiPOs can give you the best energy density. Cells with protection circuits should always be used. You can charge these crudely from 5V solar panels using the very cheap USB LiPO chargers on ebay, however this doesn't appear to work well in winter. The PCB has an SMA footprint with a plated through-hole, allowing a variety of options. This is the cheapest and easiest by far. Solder one end of the wire onto the center pad of the SMA footprint, then bend it vertically and cut so that you have a length of 8.2cm from the PCB surface. The more exact the length, the better. Ideally you'd want to check it with an antenna analyser, however very few people own one suitable for 869 MHz. This antenna does rely on a ground-plane. The PCB appears to perform this function adequately. You can extend the PCB using wires from the four corner Ground Pads. By soldering on an SMA socket, you can then purchase a factory-tuned version of the 1/4 wave wire whip. This is guaranteed to be the correct length and comes cased in plastic for durability. This antenna does rely on a ground plane and if not mounted directly to the PCB, one should be provided. This also requires an SMA socket. The dipole is a lot more efficient than the 1/4 wave and does not rely on a ground-plane. It is also a lot longer and may need additional mechanical support!